Sorry, this baby Claddagh bracelet is now sold out. 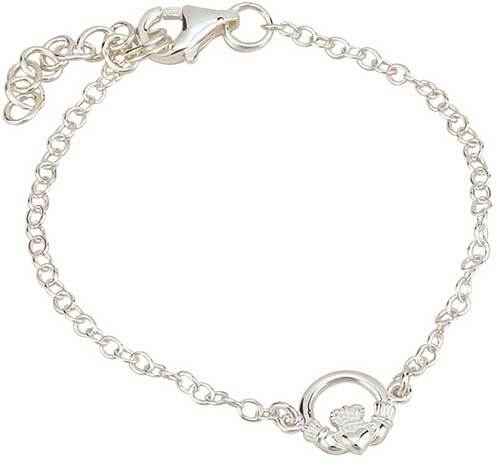 This Claddagh baby bracelet has been hallmarked sterling silver by the Irish Assay Office at Dublin Castle in Ireland. This Claddagh baby bracelet is crafted in sterling silver and it includes a 3/8" wide charm. The child's Claddagh link bracelet includes a 5" long sterling silver chain with an 1" long extender. This child's size Irish bracelet is part of the Little Fáilte Collection from Solvar Jewelry in Dublin, Ireland and it is gift boxed with a Claddagh history card, complements of The Irish Gift House.